Looking for a last-minute gift for the ska fan on your Xmas list--or need some non-saccharine holiday music to lift your spirits? Well, The Toasters have you covered! Bucket and the boys have now made the eleven Christmas/holiday themed tunes they originally recorded for the 1997 Japan-only Moon Ska Tokyo/Tachyon Records Christma-ska CD available for digital download through Amazon, iTunes, and CD Baby (you can also hear samples of all these tunes at each of these sites). Unless you were one of the lucky people that snapped up one of the few copies of Christma-ska that Moon Ska Records imported for sale through the East 10th Street store in the late 90s, these tracks have been unavailable outside of Japan for almost 13 years. 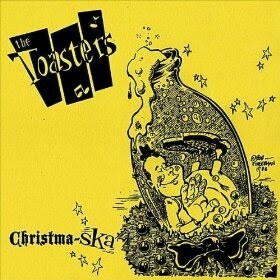 (In addition to The Toasters' cuts, the Japanese Christma-ska also featured songs by The Bluebeats, NY Ska Jazz Ensemble, The Allstonians, Buford O'Sullivan Experience, and Skinnerbox.) It also should be noted that three of The Toasters' tracks ("Happy Christmas," "Christmas Time Again," and "Rudy Christmas A Jail") are original compositions. And check out the "vintage," mid-80s Bob Fingerman illustration used on the cover--a very nice touch for a great collection of tunes!